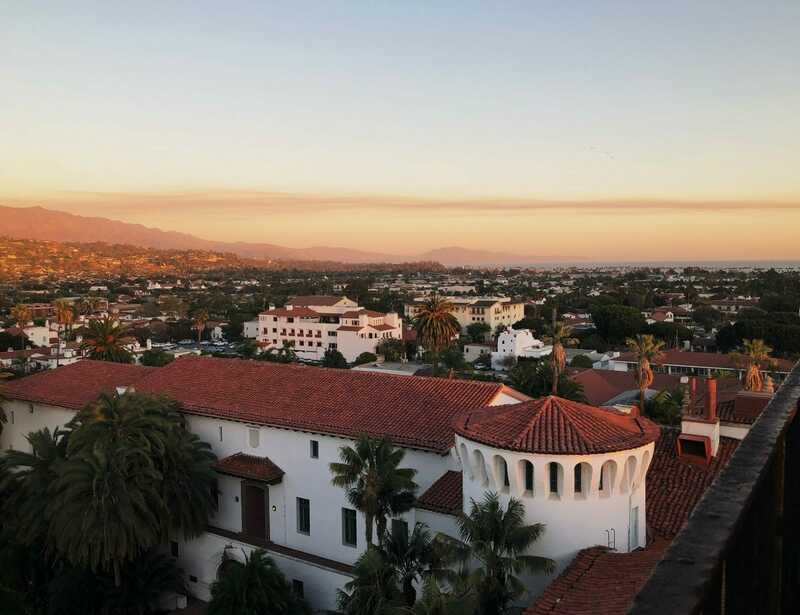 Santa Barbara, is a prime California destination with its idyllic coastal location, Mediterranean-style white stucco buildings, and nearby wineries, but it can also be hard on the wallet. Luckily, there are plenty of memorable sights around the city-from historic buildings to art shows-that won’t cost a thing. Here are seven free things to do in Santa Barbara that should be on your itinerary. On the 1st Thursday of every month, select art galleries and venues open up their doors to the public for free access to visual and performing arts events. Wander between galleries as you listen to live music, watch street performances, and drop in for wine tastings. This event is a great way to spend the evening experiencing the local art community all in one spot. Downtown restaurants and retailers are also open late as well during this event if you want to grab a bite to eat or do a bit of shopping. Check out the participating venues for the upcoming ones here. 1st Thursdays runs from 5-8pm. This Spanish-Colonial style building and gardens is not only stunning and rich with history, but it offers numerous free activities year-round, including summer movies, and flamenco shows. The courthouse is still in working order, and is the site of many local weddings. Speaking of weddings, don’t miss the Mural Room, which displays a mural of Santa Barbara’s history and is a popular spot to tie the knot. Afterwards, head to the El Mirador clock tower for panoramic views of the city. The courthouse is open daily, and offers free drop-in tours every day at 2pm (as well as 10:30am on weekdays). Immerse yourself in all things Old West Santa Barbara at this museum that is run by a local non-profit organization, and has no shortage of well-preserved horse-drawn carriages, and saddles that once belonged to riders like Clark Gable. The museum takes less than an hour to go through, but is well worth the time spent, and is a quiet alternative to the crowds of State Street. It’s open Monday-Friday from 9am-3pm. On the third Sunday of the month, tours are available from 1-4pm if you call ahead to reserve a space. Best of all admission and parking is free. This spacious local beach located next to Stearns Wharf, and close to downtown is a great place to people-watch and be a spectator for the numerous beach volleyball games going on. The water is chilly, and not ideal for a swim, but can be refreshing for wading in on a hot summer’s day. It’s a great spot to stroll along before or after grabbing a bite from one of the restaurants or cafes nearby. If you have little ones in tow, this is a great family-friendly beach with lifeguards, and restrooms. Keep your eyes peeled for the occasional pod of dolphins swimming by. For a truly Santa Barbara experience, head down to the beachfront where you can browse art and crafts made by 200 local artists. This art show was inspired by the sidewalk art shows in Europe and Mexico City, and has been running since 1965. It’s a great informal atmosphere where you can chat with the local artists about their work and even see some in action. The art show is located on Cabrillo Boulevard from Stearns Wharf to Calle Cesar Chavez, and is open every Sunday (and Saturdays of major holidays). The hours are 10am-dusk. Check here for more information from the official site. Wander out on the long curved walkway that stretches out into the sea for some serious views of the Pacific, the city, and the harbor. The breakwater was created to protect the boats (including all those fancy yachts) from the waves. Anytime of day you’ll be treated to spectacular views, but sunset is especially memorable. Depending on the tide, the occasional wave can splash over the breakwater, so wear shoes that you don’t mind getting a little salt spray on. Afterwards, get something to eat at one of the many nearby restaurants. To get a glimpse of local life, there is no better place than this vibrant (and delicious) local market with an impressive selection of fresh produce, seasonal flowers, homemade honey, and freshly baked breads. Wander among locals who are catching up on their week, with live music as a background soundtrack. This market is a great place to pick-up a few items for a picnic, or just browse and sample the fruits and veggies. Plenty of parking is available, including adjacent lots and on the street as well. This market runs on Saturdays from 8:30am-1pm, and check out the other markets in the area on other days of the week. What are your favorite free things to do in Santa Barbara?